Ahead of the opening of Terminal 5, Heathrow is trialling biometric security checks with passengers who transfer onto domestic flights from Terminal 1. 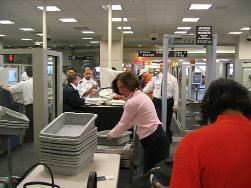 According to BAA, the airport operator, the added checks are needed because international and domestic transfer passengers go through the same areas. Should you happen to be transferring onto a domestic flight through Terminal 1 between now and March 27 when Terminal 5 opens, and agree to having your photograph and fingerprints taken, you get the perk of waiting in the international lounge instead the dreary domestic one. They sure know how to give you an incentive. At least during this test period, BAA soothes privacy fears by promising to not only encrypt the data but also destroy them within 24 hours. No need to fear misplaced CD's containing personal information, then. Image courtesy of redjar's Flickrstream.